Does military service, especially operational assignments, result in more chronic mental health issues among soldiers and veterans? Eighteen published studies including the US Millennium Cohort, eight specially probing PTSD and ten investigating depression or stress during deployment, shed some light on the answer. Analysts identified how the presence of stress reactions during a soldier’s combat exposure, his/her reception to associated front-line treatment and negative life events experienced after traumatic encounters unite to create psychological time-bombs. Several months after arrival home an increase of mental health problems was reported, especially by American soldiers who returned from Iraq. States of anxiety and depression improved between deployments, while PTSD and panic attacks remained constant. Combat exposure and not deployment caused the most adverse effects on the soldiers’ mental health. PTSD studies reported variant rates in military personnel from different countries and forces. The PTSD rate among US Persian Gulf War veterans and current Middle East conflict was as high as 17%. Comparatively, PTSD rates among British Armed Forces members were generally lower and less varied, affecting approximately 3.6% of returning UK Iraq War veterans. Two studies probed the mental health of UK Air Assault Brigade members deployed to Afghanistan and Iraq. Soldiers, who completed questionnaires after arrival in Afghanistan and departure four months later, indicated no significant change in mental health or alcohol use at the end of deployment compared with pre-deployment. The PTSD average among Australian Army veterans was closer to English percentages than American. After ten years of deployments Australian Gulf War veterans recorded a PTSD rate of 5.4%. Constant military mental health challenges are personified in the twenty-three year old male American Army Private First Class (PFC), absent without leave (AWOL) during a 2009 five month operational assignment in Afghanistan. Historically, similar behavior was exhibited by hundreds of soldiers in World War II. On this occasion the American PFC disappeared from his remote infantry post near the Pakistan border, initiating a massive search mission. His desertion caused both a Navy SEAL and a US Army National Guard sergeant to defend during individual firefights. Released Taliban videos showed the deserter taken prisoner. American intelligence and military agencies monitored the Taliban captive’s conditions via drones, human intelligence reports and satellites as secret negotiations were conducted. In May 2014 the American Army deserter was released to US Special Forces, in exchange for five Taliban detainees held at Guantanamo Bay prison on Cuba. A US Army Sanity Board Evaluation concluded the PFC suffered from schizotypal personality disorder, a mental condition in which the individual has trouble with relationships and disturbance in thinking patterns. The US Millennium Cohort studies surmised that higher PTSD rates should be expected among military personnel exposed to the greatest combat scenarios, land based troops more than Navy or Air Force personnel. 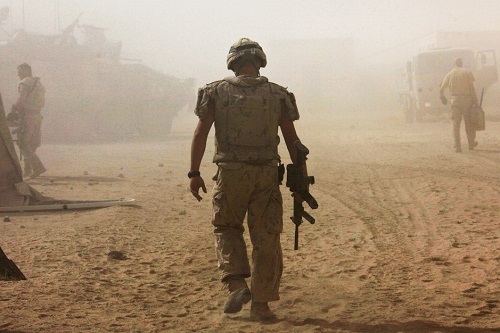 A soldier’s previous life events and state of health constitute risk factors for development of combat related PTSD.